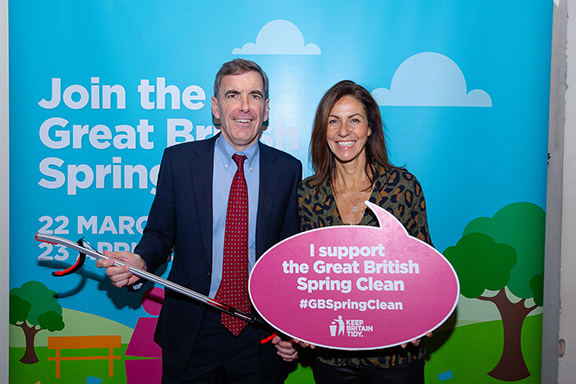 Ahead of the Great British Spring Clean 2019, local MP, David Rutley, attended an event in Parliament, to pledge his support for this important campaign, alongside television presenter, Julia Bradbury. Once again organised by environmental charity Keep Britain Tidy, this year’s Great British Spring Clean, which runs from March 22nd to April 23rd, will see up to half a million people taking action to clean up streets, parks and beaches across the country. The campaign aims to bring together individuals, community organisations, businesses and councils to make a difference to the environment on our doorstep. At the event, David, met with representatives from the charity, including Ms Bradbury, who is one of the organisation’s celebrity ambassadors, and discussed the importance of the campaign, which last year saw around 370,000 #LitterHeroes, including more than 126,651 school children, collect more than 630,000 bags of rubbish. There are more details about the campaign at www.keepbritaintidy.org. David, who is also a Minister at the Department for the Environment, Food and Rural Affairs, works in support of local initiatives to promote recycling and reduce plastic pollution. He is strongly supportive of the ‘Macc-Tastic, Less Plastic’ initiative, a community-led organisation that aims to cut down on plastic waste in and around Macclesfield. Next Story → Need a brass band?